AED.com announces how cities that strive to follow the guidelines to be a heartsafe community have increased cardiac arrest survival rates. AED.com has seen incredible results from communities that have implemented AED and CPR programs to make their areas heartsafe. With an annual death rate of 383,000, sudden cardiac arrest (SCA) continues to be the number one cause of death in the United States. Most cases of SCA happen outside of the hospital, so the best chance of surviving is if communities are prepared to handle it. While the nation survival rate tends to be between 2 and 25 percent, heartsafe cities like Seattle, WA have reported rates as high as 56 percent. To be considered a heartsafe community, a city has to follow what the American Heart Association has deemed the Chain of Survival. The first step is that members of the community know how to identify SCA and as soon as it is recognized, emergency services are contacted. The next and most important step is that cardiopulmonary resuscitation (CPR) with an emphasis on chest compressions and use of an automatic external defibrillator (AED), are done immediately. Every minute that passes without treatment decreases the chance of survival by 10 percent and although the final link is effective care by emergency medical technicians (EMTs), they often take 6-10 minutes to arrive. Cities that strategically place AEDs and regularly hold public classes on how to use them and perform CPR, tend to have the highest survival rates. Seattle, WA, Portland, ME, and Scottsdale AZ, are just a few examples of cities that have reported increased survival rates after public access defibrillator programs. “AED.com has seen incredible results from communities that have implemented AED and CPR programs to make their areas heartsafe", commented Justin Darby, Marketing Director of AED.com. "It is always encouraging to see residents advocating AED implementation in their city and not stopping until it happens. Those are the people saving lives." 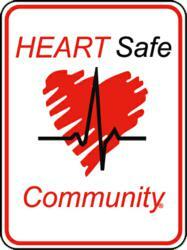 AED.com is located in Brentwood, TN and has been assisting communities and businesses in becoming heartsafe since 1999. 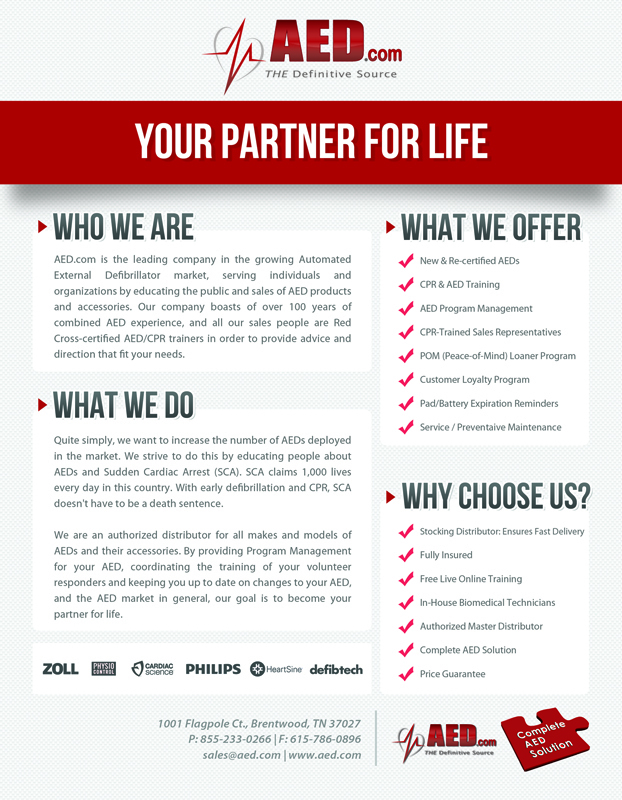 The company carries all brands of AEDs and accessories, including Physio-Control, Zoll Medical, Philips Healthcare, Cardiac Science, Heartsine and Defibtech.